A newly-developed vaccine against swine influenza is being launched in the UK by Hysolv Animal Health UK. The vaccine, Respiporc FLUpanH1N1, protects against the pandemic strain of flu pdmH1N1(2009) which is particularly prevalent in the British Isles. 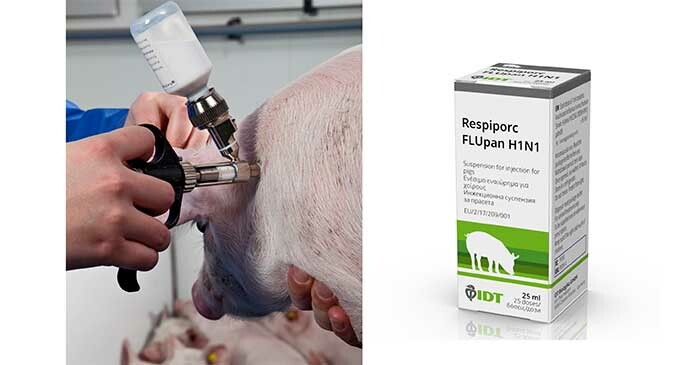 “Swine flu can be devastating to a herd and this vaccine will broaden protection, particularly when used with our existing vaccine Respiporc FLU3, which we are strongly advising,” said Hysolv director, Geoff Hooper. “With winter approaching we are urging pig producers to consult their vets without delay. Infection with the pandemic flu virus causes acute respiratory symptoms in pigs and can have a severe economic impact on a herd through increased mortality in young pigs, reduced weight gain in finishers and abortion in pregnant sows. Infection can also lead to secondary bacterial and viral infections causing further complications. Since it is a zoonotic disease, pigs are at risk from catching the pandemic flu from humans and transmission can occur from pigs to humans so, there are health implications in addition to the financial effects. Two 1ml doses of the inactivated vaccine can be injected intramuscularly three weeks apart to pigs from 56 days old, providing immunisation to the majority of animals within seven days. Developed by IDT Biologika, the vaccine has been successfully used in Germany, where 1.7 million doses have been prescribed. Field trials have shown that vaccination not only protected against clinical signs of influenza it resulted in improvements in reproduction and piglet performance. Respiporc FLU3 confers protection against three other strains of swine flu (H1N1, H1N2 and H3N2). When used together, the two vaccines protect pigs against the most relevant strains in the British Isles.